For other uses, see Gemstone (disambiguation). "Precious Stone" redirects here. For the James Bond character, see Hurricane Gold. "Gem", "Gems", and "Jewels" redirect here. For other uses, see Gem (disambiguation), Gems (disambiguation), and Jewels (disambiguation). A gemstone (also called a gem, fine gem, jewel, precious stone, or semi-precious stone) is a piece of mineral crystal which, in cut and polished form, is used to make jewelry or other adornments. However, certain rocks (such as lapis lazuli and opal) and occasionally organic materials that are not minerals (such as amber, jet, and pearl) are also used for jewelry and are therefore often considered to be gemstones as well. Most gemstones are hard, but some soft minerals are used in jewelry because of their luster or other physical properties that have aesthetic value. Rarity is another characteristic that lends value to a gemstone. The traditional classification in the West, which goes back to the ancient Greeks, begins with a distinction between precious and semi-precious; similar distinctions are made in other cultures. In modern use the precious stones are diamond, ruby, sapphire and emerald, with all other gemstones being semi-precious. This distinction reflects the rarity of the respective stones in ancient times, as well as their quality: all are translucent with fine color in their purest forms, except for the colorless diamond, and very hard, with hardnesses of 8 to 10 on the Mohs scale. Other stones are classified by their color, translucency and hardness. The traditional distinction does not necessarily reflect modern values, for example, while garnets are relatively inexpensive, a green garnet called tsavorite can be far more valuable than a mid-quality emerald. Another unscientific term for semi-precious gemstones used in art history and archaeology is hardstone. Use of the terms 'precious' and 'semi-precious' in a commercial context is, arguably, misleading in that it deceptively implies certain stones are intrinsically more valuable than others, which is not necessarily the case. 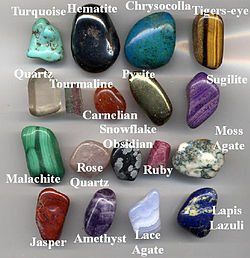 Gemstones are classified into different groups, species, and varieties. For example, ruby is the red variety of the species corundum, while any other color of corundum is considered sapphire. 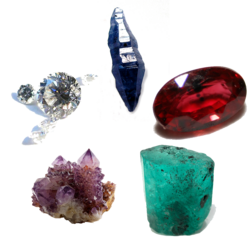 Other examples are the emerald (green), aquamarine (blue), red beryl (red), goshenite (colorless), heliodor (yellow) and morganite (pink), which are all varieties of the mineral species beryl. A mnemonic device, the "four Cs" (color, cut, clarity, and carats), has been introduced to help the consumer understand the factors used to grade a diamond. With modification, these categories can be useful in understanding the grading of all gemstones. The four criteria carry different weight depending upon whether they are applied to colored gemstones or to colorless diamonds. In diamonds, cut is the primary determinant of value, followed by clarity and color. Diamonds are meant to sparkle, to break down light into its constituent rainbow colors (dispersion), chop it up into bright little pieces (scintillation), and deliver it to the eye (brilliance). In its rough crystalline form, a diamond will do none of these things; it requires proper fashioning and this is called "cut". In gemstones that have color, including colored diamonds, it is the purity and beauty of that color that is the primary determinant of quality. Aside from the diamond, the ruby, sapphire, emerald, pearl (not, strictly speaking, a gemstone), and opal  have also been considered to be precious. 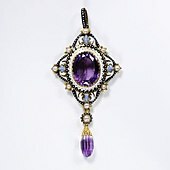 Up to the discoveries of bulk amethyst in Brazil in the 19th century, amethyst was considered a precious stone as well, going back to ancient Greece. Even in the last century certain stones such as aquamarine, peridot and cat's eye ( cymophane) have been popular and hence been regarded as precious. Gems which are transparent are normally faceted, a method which shows the optical properties of the stone's interior to its best advantage by maximizing reflected light which is perceived by the viewer as sparkle. There are many commonly used shapes for faceted stones. The facets must be cut at the proper angles, which varies depending on the optical properties of the gem. If the angles are too steep or too shallow, the light will pass through and not be reflected back toward the viewer. The faceting machine is used to hold the stone onto a flat lap for cutting and polishing the flat facets. Rarely, some cutters use special curved laps to cut and polish curved facets. Nearly all tanzanite is heated at low temperatures to remove brown undertones and give a more desirable blue / purple color. A considerable portion of all sapphire and ruby is treated with a variety of heat treatments to improve both color and clarity. Synthetic gems are physically, optically and chemically identical to the natural stone, but are created in controlled conditions in a laboratory. Imitation or simulated stones are chemically different from the natural stone but may be optically similar to it; they can be glass, plastic, resins or other compounds. ^ "Artificial treatment of gemstones". Dictionary of Gems and Gemology. Berlin, Heidelberg: Springer Berlin Heidelberg. 2009. p. 50. doi: 10.1007/978-3-540-72816-0_1308. ISBN 9783540727958. Wikimedia Commons has media related to Gemstones. Look up gemstones in Wiktionary, the free dictionary.